In the spring of 2012, SHS participated in several events surrounding the 100th Anniversary of the Sinking of the Titanic. Isidor and Ida Straus were on the Titanic's maiden voyage. Their story has captivated people around the world. These events, intended to memorialize and celebrate their lives, were conducted surrounding the month of April and were held in a variety of venues. The photographs in the slideshow below are just a glimpse into the incredible experiences that family, friends, and members of SHS had during these events. 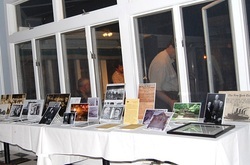 The Straus Historical Society was asked by Jim Foley of the Long Branch Historical Association to attend a cocktail party at the Ocean Beach Club in Elberon, N.J. on Thursday, August 16, 2012. Dr. Paul A. Kurzman, who, as a child, had been a member of the Ocean Beach Club and remembered the place fondly, gave a moving speech about Isidor and Ida Straus and the legacy they left their descendants. Isidor and Ida Straus are particularly relevant to this area as they owned a summer home known as Sunnyside only a mile up the road from the Ocean Beach Club. SHS displayed photographs and memorabilia and offered the Autobiography of Isidor Straus and June McCash's Book A Titanic Love Story for sale. Dr. Paul Kurzman was available to sign the Autobiography of Isidor Straus and show the locket that was recovered along with Isidor's body. The event was a great success. SHS is grateful to Jim Foley and the LBHMA for the wonderful evening. On the weekend of April 19 -21, 2012 Paul Kurzman and Joan Adler attended the Titanic Historical Society's annual convention in Springfield, MA near where the Titanic Historical Society has its museum. 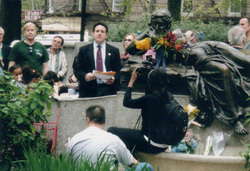 Karen and Ed Kamuda, the founders of THS, hosted many tributes to Titanic. lecture by Simon Wells, the owner of Titanic's sister ship, Britannica. Before Wells' talk there was a cocktail hour with ample time for guests to mingle and for people to buy The Autobiography of Isidor Straus. Paul Kurzman graciously inscribed each book purchased and stood for photographs with the book in hand next to its purchaser. Several guests came in period costume. After a rainy night we were happy to see the sun shining on Saturday morning as we joined a large group of invited guests at Oak Grove Cemetery in Springfield, MA where a special ceremony culminated in the unveiling of a granite Titanic memorial. Paul spoke movingly about the legacy of his great grandparents. Many people commented that they were unable to hold back tears during his talk. Saturday evening we went to a gala at The Castle in Springfield. More than two hundred people attended, many in period costumes. During the cocktail hour there was time for people to buy books and get them signed. A contest was held to judge who wore the best costume. A speaker shared his insights into the lives of many of the first class passengers. His talk was accompanied by a slideshow. Two ocean liners docked in New York City in mid April after recreating the transatlantic voyage of Titanic. 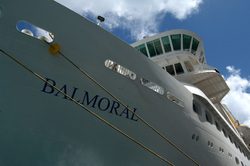 Paul Kurzman and Joan Adler were invited to speak to the passengers of one of them, the MS Balmoral. Several of passengers were dressed in period costume when they attended Paul's talk. Many passengers were dressed in this manner for the entire duration of their ten day voyage. The passengers were thoroughly knowledgeable about Titanic history. Many were descendants of people who had been on the maiden voyage while others simply are fascinated with every aspect of Titanic. They enjoyed learning about the Strauses from a direct descendant and posed many thoughtful questions at the end of Paul's talk. They brought photographs and prepared a photo loop that was shown on a large screen. Straus family members Paul Kurzman, Barbie Gurgan and Liza Loop were invited to The Titanic Museum Attraction in Pigeon Forge, TN. On Friday, April 13th they were treated to a VIP tour of the Titanic museum. Reporters interviewed Paul, Barbie and Liza for local television news and for the local newspapers. Paul Burns, curator of exhibits, hosted a dinner for the descendants and Titanic historians. 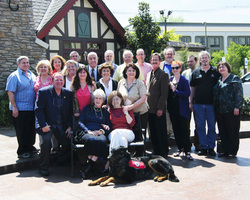 Historian Phil Gowan hosted this interesting luncheon. The spectacular evening presentation began after yet another wonderful meal, this time hosted by Mary Kellogg and John Joslyn, owners of the Titanic Museum Attraction. There were songs from the Broadway musical, Titanic, and songs by several choirs. 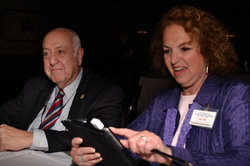 Descendants of Titanic passengers were introduced to a crowd of more than 2,500 guests. A wonderful cocktail party in the Executive Suite at R. H. Macy & Co. was held on April 10th. This venue was chosen because of the Straus' more than 100 year ownership of Macy's. Once again, the Society brought artifacts and photographs. The photos were displayed on large black panels and artifacts were displayed in glass enclosed cases. Family members and invited guests enjoyed the elegant atmosphere as they viewed the displays, enjoyed the delicious hors d'oeuvres and mingled with one another. Although there were no formal speeches, Robin Hall, Senior Vice President of Macy's Parade and Entertainment Group, Paul Kurzman and Joan Adler briefly thanked the guests and spoke about the legacy left by Isidor and Ida. 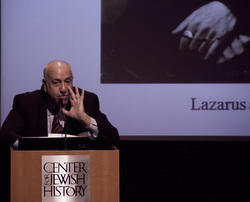 On April 1st, 2012 SHS and the American Jewish Historical Society co-hosted "Love, Loss & Legacy: Isidor and Ida Straus and the Titanic" at The Center for Jewish History in New York City. SHS brought artifacts from the collection which were on display in the Great Hall at the Center along with many, many photographs of the family and of the events in their lives. Professor Steven Biel, Executive Director of the Humanities Center and Senior Lecturer in History and Literature at Harvard University, and author of Down With The Old Canoe: A Cultural History of the Titanic Disaster, spoke about the culture of the period. Joan Adler spoke about the history of the family including the events leading up to Isidor and Ida's last winter in Europe and their final trip aboard Titanic. 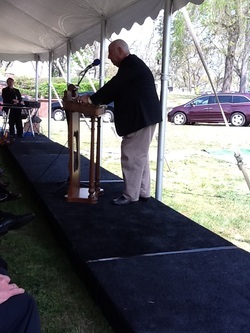 Then Paul Kurzman, their great grandson, gave a moving talk about their legacy and what that means to him. A brief Q&A followed the talks. On March 19th, 2012, Paul Kurzman spoke about his family before two assemblies at the Isidor and Ida Straus School, Public School 198, on Manhattan's Upper East Side; kindergarten, first and second graders in one and the rest of the elementary school classes in a second assembly. Joan Adler prepared a slide show to enhance his comments. The students were mesmerized. After Paul's talk the students were proud to show us their own creations ranging from poetry, to artwork and even a song and dance number. At the end of each assembly several students stayed behind to ask more questions of Paul. Their questions showed how much they appreciated his coming to their school and how excited they were to learn about the history of the people for whom their school was named. In February of 2012, Joan Adler spoke twice in California. First, Joan spoke to a large audience at the Jewish Genealogical Society of Los Angeles. The following day, she spoke to another large group at the Museum of Tolerance in conjunction with the Simon Wiesenthal Center. 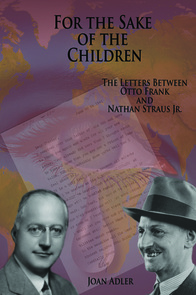 Both programs focused on her research with the Otto Frank and Nathan Straus, Jr. letters that were discovered in 2007 and her book. After each presentation, there was an extensive Q&A session with the audience. Because her book had yet to be published, Joan was unable to do a book signing. Both centers, however, invited her back in 2013 once her research was published to present and sell and sign books. Joan's book was published in early 2013 and is now available for sale. Check our Upcoming Events page for more information about her return to LA.